A five-minute ride on the "On Time," the 3 car plus passenger ferry from the Edgartown dock takes you to Chappaquiddick, "an island off an island," with dirt roads lined with blueberry bushes and an area of frequent sightings of deer, osprey, otters, shorebirds, and turtles. Vacationers choose Chappy for the privacy and tranquility this 6 by 3 mile spit of sand offers. By bike or kayak, explore the sand dunes and tidal ponds, the glacial moraine, and the sand plain grassland habitats. Fish for blues, bass, or bonito from some of the East Coast's best fishing places--the Gut, Wasque Point, and Cape Pogue. 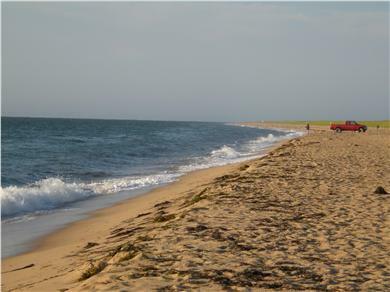 Enjoy the miles of unspoiled beaches accessible by 4-wheel drive. Join one of The Trustees of Reservations Nature or Lighthouse tours. Visit the 3-acre Japanese garden at Mytoi. Chappy offers miles of walking trails on the many Landbank properties.